I don't drive very often. I prefer to live in a place where I can walk or take the bus to where I need to go. However, sometimes it's a necessary evil. When I say evil, I say this because I have not had the best luck with cars. This may be due to the fact that I usually have an older car. Since I don't want to spend money to buy a new car, instead I spend money fixing an old one. I guess you have to choose and this is what I have chosen. I am talking about this because my car broke down on Monday. I probably use my car once a week, usually to meet up with my friend for a walk (she lives about 45 minutes from me, so we tend to meet somewhere in the middle). I know this is ironic, driving somewhere to get exercise, but sometimes it's fun to try new places where the bus can't go. This time, however, I was on my way back to Oakland to pick up some stuff to take to Santa Cruz. After a stop along the way, I was getting back on the freeway and it just sputtered and died (on the on ramp). So I called AAA. I am getting to be pretty good at dealing with breakdowns, as I have had several over the years, some better than others. Mid 90s: I get my first car. It's old. The starter stops working, but luckily if I park on a hill, I can pop the clutch. This leads to my profound knowledge of every hill/slant/bump in my hometown. When there is no hill, my friends help me push my very heavy car far enough to pop the clutch. This leads to me not having any more friends. I start leaving the car running when I go into stores (yes, you can do this in my hometown). I finally end up taking out the starter myself THREE times and having it re-lathed three times. This is quite costly, even though I have done the work myself. Finally we find out that the part that was needed was a tiny piece near the starter that costs mere dollars. Late 90s, same car: I am driving to my friend's house for NYE and I break down on the Sacramento causeway due to overheating. This was when I didn't have a cell phone. Several people call 911 because they think I am on fire. Thank goodness they do, because I have the firemen call me a tow truck. Mid 2000s: A different car. Still old. I am commuting from Sacramento to San Francisco and the car decides to call it quits on the Bay Bridge right AT the toll booth. People are honking and giving me the finger. On the plus side, the tow truck comes VERY fast. Also I save $5 on bridge tolls. Present Day: About a month ago, I went to use the car for my once a week jaunt and it wouldn't start. I know a couple of things about cars, mostly that (a) it was not a problem with the battery, (b) it was not a problem with the starter and (c) I was not out of gas. As soon as the AAA guy comes, he asks me if the car is out of gas. I wonder if some people are unsure of the answer, because the guy that came to get me on Monday asked the same question. Do you often have car trouble? Have you ever tried to fix your own car? 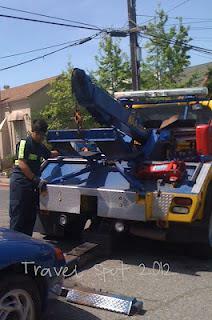 Have you ever ridden in the tow truck with the driver?